With less than a week until the 2016 NCAA Men’s basketball tournament field is selected, we wanted to see some of the tournament’s most frequent teams from a mortgages standpoint. Using Marksman data, we took the states with the most tournament appearances since it’s creation in 1939, and stacked them up against each other using a few key mortgage figures. While California has the most championship-winning program in the history of the NCAA tournament, the state is very average compared to the rest of the field from a mortgages standpoint. 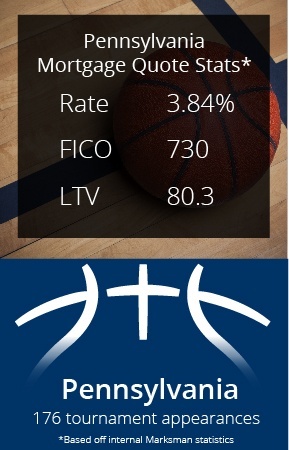 Its average mortgage rate ties for second highest at 3.84%, and while it does boast the highest average FICO (by a slim margin) at 735, it also has a higher average LTV than all but one other state, which comes in at 80.7. 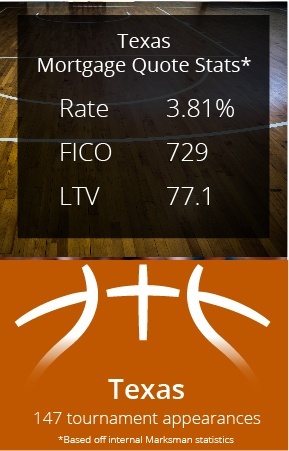 In regards to mortgages, much like California, its stats are very middle of the road compared to the other teams in the field, and its FICO is actually tied with California’s for second highest. 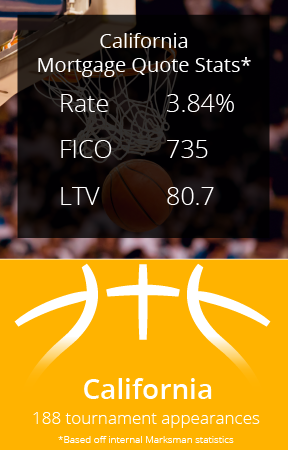 While the average FICO is a bit lower at 730, the average LTV is also slightly lower as well at 80.3, causing the two to even out to some degree. Easily the strongest contender from a mortgages standpoint in this field, North Carolina has the best, or nearly the best numbers of the three different stats we compared. Its average rate ranks the lowest of all five states at 3.75%, and the average FICO and LTV each rank second-best as well, with the former just getting edged out by California, and the latter falling just short of Texas. 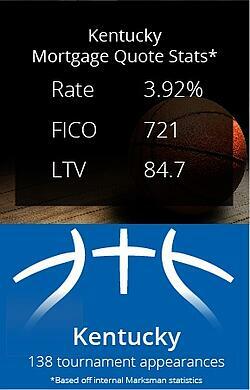 Regardless, North Carolina clearly boasts the most impressive mortgage résumé of the five teams listed. While Kentucky might have one of the single most storied programs in NCAA history, its mortgage statistics are not quite up to that standard. The state holds the highest average interest rate at 3.92%, the lowest average FICO at 721, and the highest average LTV at 84.7, making it the worst in all three categories compared to the rest of the states. Finally, we have Texas, which doesn’t stack up too badly to the rest of the field. Its average interest rate sits at the second lowest at 3.81% behind North Carolina, and it has the lowest LTV of any of the states at 77.1. However, Texas also has the second-lowest average FICO at 729, and while it’s quite a bit ahead of last place Kentucky, it’s also quite a bit behind California’s high mark. With the best, or nearly the best number sin every category, North Carolina takes home the NCAA mortgages tournament crown. 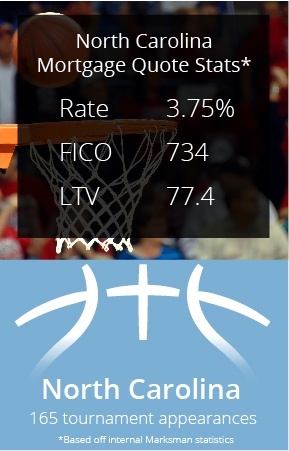 While a couple of the other states could somewhat compare, the very low rate, and strong LTV and FICO numbers make it a pretty clear-cut choice. Whether this has any impact on the actual tournament, however, remains to be seen. Regardless of the state you’re in, getting your rates online in front of thousands of borrowers every day is key to getting yourself in front of prospective borrowers. Find out today how Mortech can get your rates in front of a huge online audience, and how you can utilize our tools to bring in more leads, and close more loans.